The highest industry standard, made with hand-selected ingredients like real meat, poultry, seafood and vegetables for deep, rich, made-from-scratch flavor. Our Meat First™ technology means our bases and your food dishes taste like the meat, seafood or vegetables used to make them. The widest range of made-from-scratch flavors gives you endless menu possibilities. Exacting standards ensure that every jar, canister or pail contains the same taste characteristics every time. 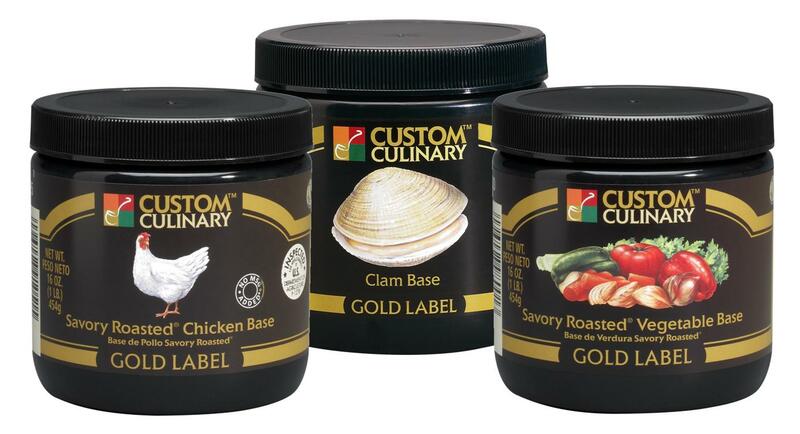 Custom Culinary® Gold Label Savory Roasted® Bases instantly add slow-cooked, richly roasted intensity, with subtle vegetable accents.